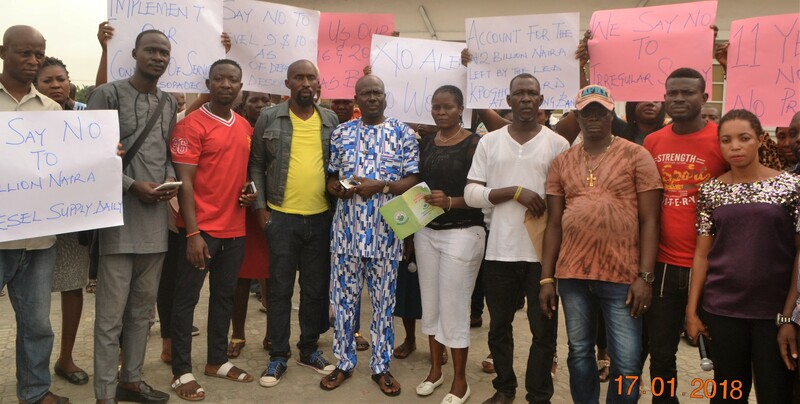 Protesting workers of Delta State Oil Producing Areas Development Commission, DESOPADEC, have challenged the Hon. Godwin Ebosa led DESOPADEC Board to account for N2 billion allegedly “left at Sterling Bank by the immediate past Oritsuwa Kpogho Board”, insisting until the Commission’s Management pay them their 2016 and 2017 end of year bonus (Christmas Bonus) they won’t resume work. 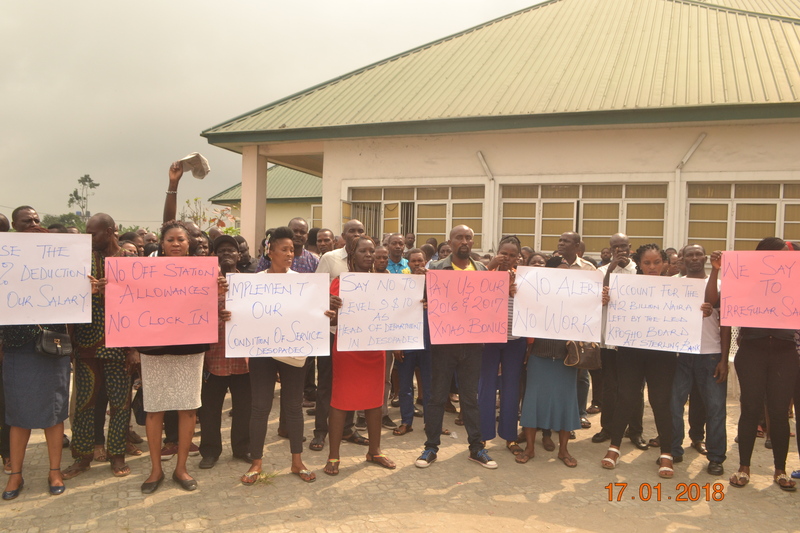 The workers who continued their protest for the 8th day in Warri Wednesday January 17, carried placards with inscriptions such as, “no off station allowances, no clock in”, “implement our condition of service DESOPADEC”, “we say no to level 9 & 10 as Head of Department in DESOPADEC”, “11 years now no promotion”, “we say no to 1 million naira diesel supply daily” and “account for the 2 billion naira left by the Kpogho Board at Sterling Bank”. Chairman of Amalgamated Union of Public Corporations, Civil Services Technical & Recreational Services Employees, AUPCTRE, DESOPADEC Branch, Comrade John Osah told newsmen during the protest that end of year bonus (13th month) is enshrined in the condition of service of the commission and they have not been paid since 2016, while over 800 staff so far transferred have not gotten their allowances. A member of the congress, Edeyan Abigail Oghenevoke alleged that despite being owed two years end of year bonuses, each member of the current DESOPADEC board went home with N120 million in December 2017 and monies running into millions of naira were purportedly spent on 30 persons for foreign frivolities. According to them, the Okowa administration releases between 2 to 3 billion naira monthly to the current DESOPADEC Board, yet they continually cry of lack of funds to meet up basic responsibility.